An older specimen that came out in the 1960's, this is an alluvial piece that is distinctly waterworn. 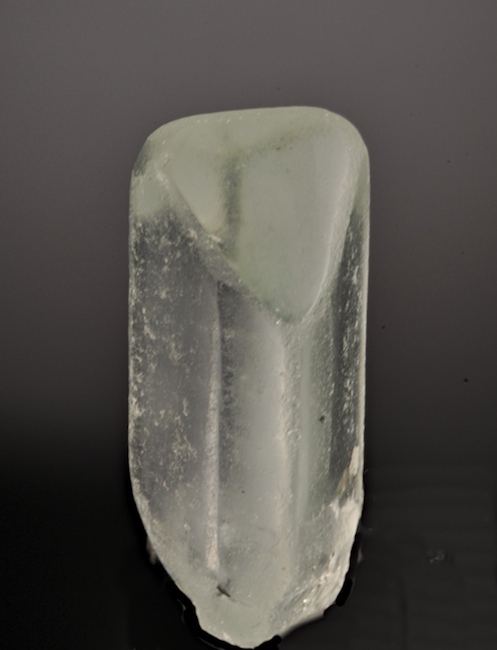 The remarkable thing is that the crystal form is very clear despite the tumbling and softened edges, it still has a gemmy clear core, no internal cleaves and typical habit. 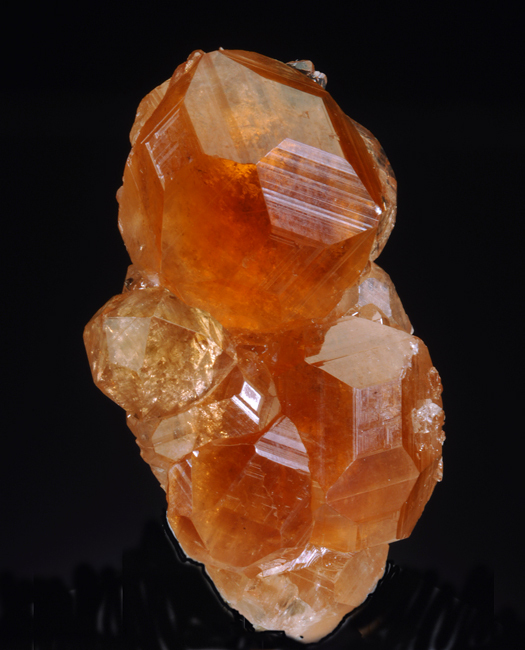 Ex Schortmann's minerals (with label), they were the first to offer Nigerian Topaz that was collected by missionaries in that period from gravel bars. This has a very faint blue green hue but in most lighting seems milky white. Intense color and in excellent condition, a rich specimen of well crystallized Kammererite. The Kop Krom mine has produced by far the best examples of this rare Chrome Clinochlore, this piece also has a druze of tiny Zaratite crystals best seen under magnification. The Kammererite crystals on this piece are not the typical plates or druse, they are sharp, prismatic and well exposed on the matrix. Hard to find in this quality. 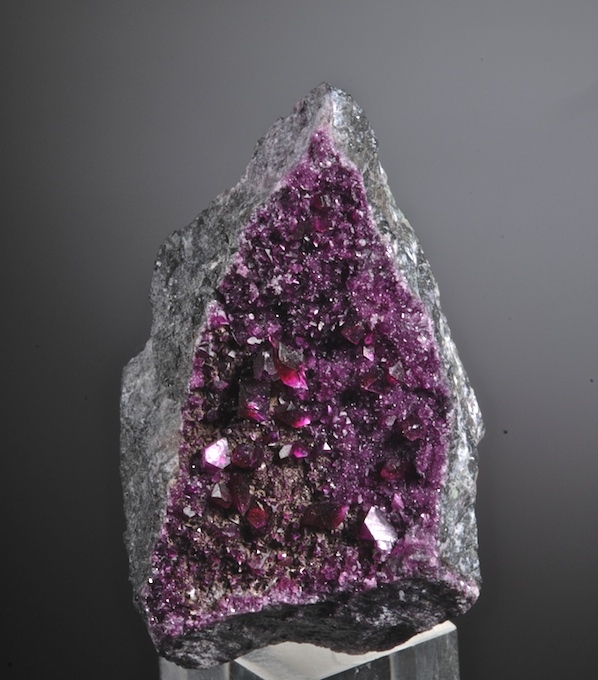 A large cabinet sized matrix of quartz and mixed pegmatite that hosts a dense mass of interlocked purple Apatite crystals. From the famed Nevel Quarry in Maine that is more famed for fine Tourmalines. The sharp and glassy crystals reach over 9mm but most are about 5-6 in size. 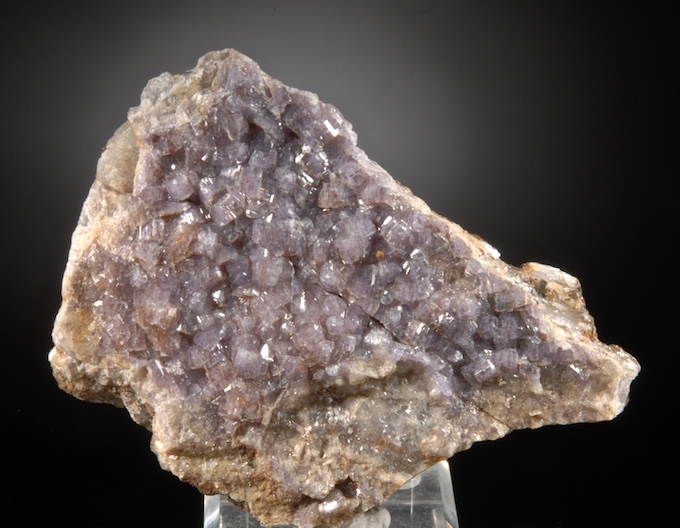 The color is a good medium purple that is lighter than from the nearby Pulsifer Quarry. Specimens of this size and quality are very rare from the Nevel and this one also has a few tiny unidentified Phosphate crystals as well. Minor bruises are seen with magnification and some cracks are noted in the matrix yet the naked eye display is excellent. A fine, high impact specimen with well formed red rhombs (up to 2.2 CM) offset with branching crystallized Acanthite. 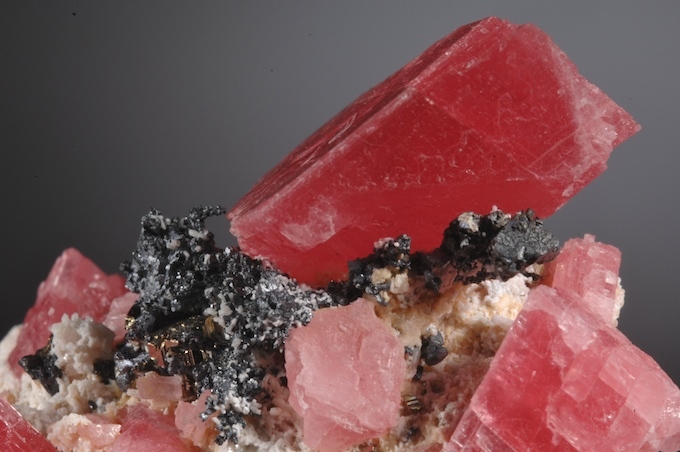 This specimen shows very well the combination of Sulphide species that were associated with this remarkable find of Rhodochrosite. Excellent condition and form, this can be displayed from several angles. Gemmy twin crystals with sharp edges and bright luster on a contrasting matrix. In good condition overall but with some edge chipping, hence more affordable. This is from finds made in the 1990's which had especially good color. 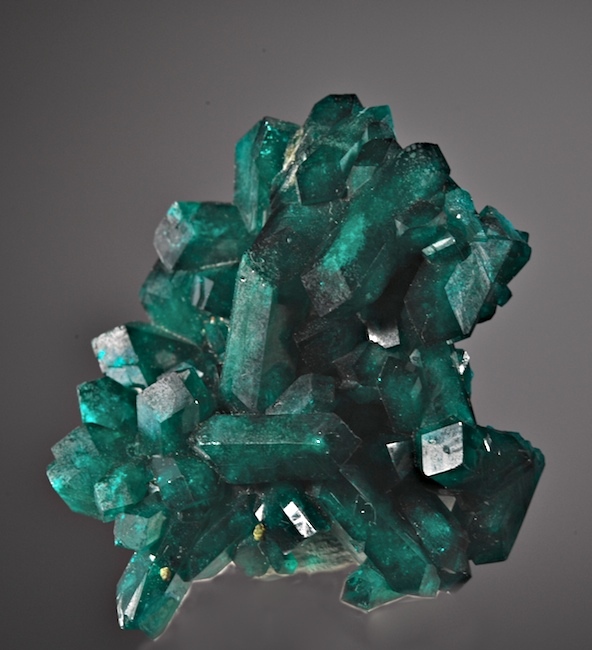 Pure emerald green Dioptase in a jackstraw arrangement of bright crystals, in excellent condition with no matrix. 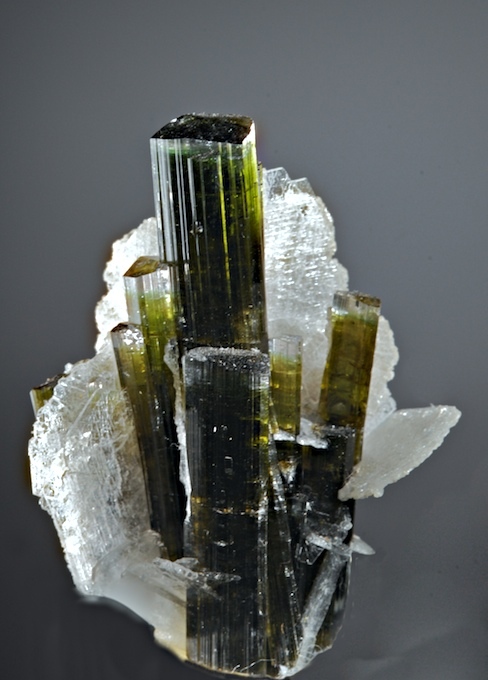 A fine Kaokoveld specimen with gemmy zones and individual crystals over 1.6 CM. Very 3 dimensional, this has very good esthetics. 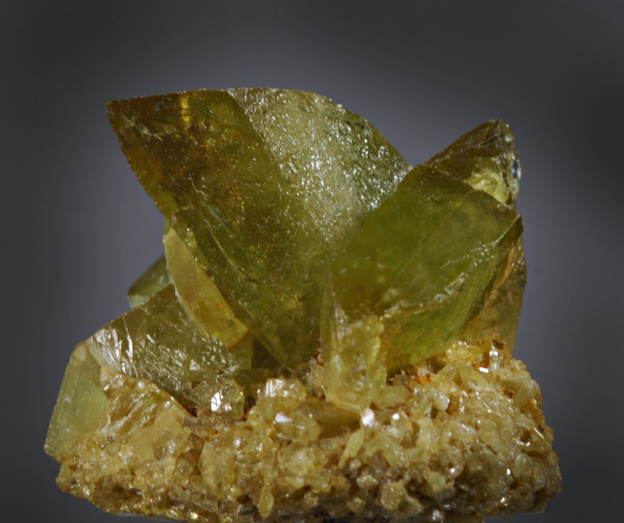 A very cute small specimen with sharp Tourmalines that grade from a bottle-green to colorless at the termination. Nice esthetics and fine form - there is no damage at all on the display side. A tiny chip on a small crystal on the back of the piece that can not be seen is the only issue to mention and it is quite minor. The contrast with the feldspar is great, this is a vintage 1980's piece ex Larry White Collection. Gem clear, sharp and with top glass-like luster this has a lot of impact for its size. From the long flooded deep areas of the main pit at Jeffrey, this is the sort of Garnet that made this spot world famous. Flat contact on back (typical of these plates) and very 3 dimensional of the display side, excellent condition. These have become very hard or very expensive to get in this quality.